The European Space Agency (Esa) has drawn up its shortlist of the best places to look for life on Mars. The locations on the shortlist are all being targeted as potential landing sites for these missions. They host some of Mars' oldest rocks, which were in contact with water just after the planet's formation. Of particular interest is a class of hydrated minerals which contain water in their crystalline structure. These minerals are known as phyllosilicates, but are more often known as clay minerals. Dr Jean-Pierre Bibring, who is based at the University of Paris, was speaking at a meeting on the exploration of Mars held at the European Space Research and Technology Centre (Estec) in Noordwijk, the Netherlands. The planetary researcher told BBC News: "Phyllosilicates are not just regions where we think water must have been. We also think they are places that helped reactions to take place. He added: "On the early Earth, all the primordial biochemistry took place in phyllosilicates as well." The list includes two sites at Meridiani Planum, the flat expanse near Mars' equator where Nasa's Mars Exploration Rover (Mer) Opportunity found possible evidence for an ancient sea. John Parnell, a petroleum geologist from the University of Aberdeen, who is involved with the mission, said: "If you are looking for fossil life, you want some kind of mineral that is a good matrix for preserving organic matter. That could be phyllosilicates. "The other option is to look at evaporites (like sulphates). We know from many lines of evidence, that there are sulphates in the soils. Sulphates have been around for a long time on Mars and could have trapped evidence of life." Dr Parnell favours sending the rover to Meridiani Planum where both phyllosilicate and sulphate minerals can be found in abundance. According to Dr Bibring, Nasa is studying a similar shortlist of six landing sites for its Mars Science Laboratory (MSL) mission, due to fly even sooner than ExoMars - in late 2009. He added that there was no chance of the US and Europe choosing the same landing site. The multi-million-euro European mission calls for a rover weighing just over 200kg that can trundle over the Martian surface looking for signs of past or present life. It will carry a 16.5kg suite of scientific instruments to carry out the survey, including a drill that can probe 2m below the surface. This overall design is known as the "enhanced baseline" and was approved by Esa delegates in June. The industrial partners were asked in July to cost the design and construction of the rover and have now delivered their formal proposal to Esa. The industrial cost is likely to comprise just over 50% of the mission's overall price. Esa officials have told member states to expect ExoMars to cost in the region of one billion euros. Some aspects of the mission's design have yet to be fixed, and are likely to remain flexible until next year. Not least of these is the decision on which launcher ExoMars will fly atop. Esa will have to choose between Europe's Ariane 5 ECA launcher and Russia's Proton rocket. For the time being, the space agency has designed the mission to be compatible with both. He said of the Proton option: "It is not considered at the level of the mission. First, because we need the performance and the Proton does not have the performance; and second, this is a European project and it has to be launched by a European rocket." 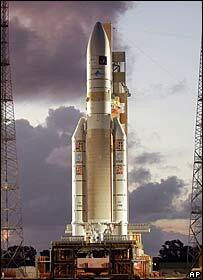 Launching on an Ariane 5 from Europe's own spaceport in Kourou, French Guiana, will cost the agency about 150m euros - significantly more than the 90m-euro asking price of a Proton launch. Dr Jorge Vago, Esa's ExoMars project scientist, said: "The baseline option is to launch with an Ariane 5. But there are a number of things that need to be done at Kourou for that to be possible." These include the implementation of approval processes for the handling of radioactive materials, which will be used in the rover's instruments. ExoMars's launch campaign is also much longer than that for most commercial and scientific launches. This is partly because it needs to meet strict "planetary protection" standards, requiring sterilisation of the spacecraft to prevent terrestrial bugs contaminating Mars. Esa is discussing with Arianespace how this longer integration period could be accommodated. If Kourou is able to satisfy these requirements, Dr Vago explained, ExoMars could launch on an Ariane. If not, he added, the space agency was required to have a back-up option which would need to be procured from outside Europe. The mission's price tag will be discussed at a meeting of ministers from Esa member states in November 2008.